Though it may seem strange to some folks, there are plenty of individuals who absolutely love pit bulls. They insist that they’re just as capable of being loving and obedient as any other dog, if not more so. As popular as they are in some circles, though, pit bulls certainly have reputations, and they’re not always positive ones. Many believe these dogs are naturally vicious, dangerous, and incapable of showing the same kind of gentle affection that other pups can. So for those people, this sounds like a recipe for disaster: a cute, curious little kitten relentlessly annoying a giant pit bull. That’s exactly how this video starts, and it’s a nail-biter until the end—when something truly unexpected happens! It’s Definitely No Secret At All That Pit Bulls Get A Bad Rap. Many People Believe That They’re Inherently Violent Animals, Even Going On To Perpetuate The Notion That Their Jaws “lock” When They Bite. While Just About Any Breed Of Dog Can Have Aggressive Tendencies If They’ve Been Abused Or Had Some Other Sort Of Traumatic Past, The Truth Is That There’s Hardly Anything About Pit Bulls That Makes Them Naturally More Dangerous Than Any Other Dog. 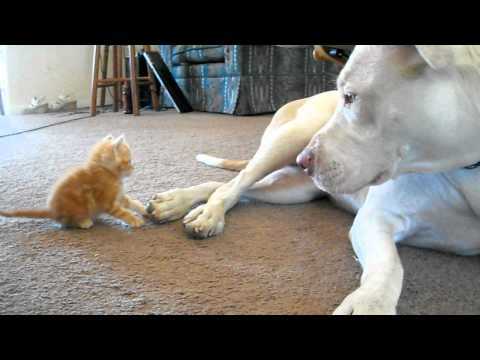 See, This Tiny, Adorable Kitten Couldn’t Help But Walk Right Up To This Big Pit Bull And Start Playing Around With His Paws. For Those Who Have Heard Horror Stories About Pit Bulls, This Must Be A Terrifying Sight To Behold! The Kitten Seemed Unfazed By The Danger, And For A Brief Moment, The Two Animals Spent A Brief Moment Simply Staring At Each Other. From That Point Forward, The Tension Between Them Seemed To Rise. What Would Happen? “Hey, What’s Going On Under Here?” This Kitten Just Couldn’t Help Himself When It Came To Trying To Understand Every Little Aspect Of This Massive Creature Who Was Several Times His Size. Most People Who Know Pit Bulls Well Enough Would Be Able To Tell You That You Probably Shouldn’t Have Expected The Dog To Gobble Up The Kitten, Or Anything Similarly Violent That Others Might Expect! Pit Bulls Are, After All, Sweethearts. Even So, It’s Pretty Remarkable That The Pit Bull Displayed Such Incredible Patience With The Tiny Kitten. He Really Didn’t Seem To Mind The Small Animal Crawling Around On Him At All. In Fact, He Was Perfectly Patient! Pit Bulls Couldn’t Be Cuter Or More Affectionate, Which Is Just Part Of The Reason Why It’s Such A Shame That They’re So Poorly Treated And Understood By The Public. They Just Want To Be Loved! That Wasn’t Even The Most Amazing, Or The Most Adorable, Part. Just Wait Until You See What The Pit Bull Did Toward The End To Show The Kitten What He Thought Of Him. It Couldn’t Be Cuter!